Do you have a cat or dog that is constantly asking to go in and out of the house? Are you constantly opening the door or window for them? If you answered yes to any pf those questions, it is time to install a pet screen door. Pet screen doors are a low cost way of providing a convenient way for your pet to get in and out of the house. By providing you pet with their own means to get in and out of the house, you free yourself from constantly running over to open the door. 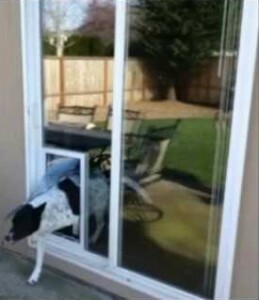 You pet will no longer need to jump up on the door every time they want to get in or out and this will save you money on screen door repairs. We provide custom pet screen door solutions. Our pet doors come in a large variety of sizes and colors to accommodate your homes style and the size of your pet. Give your pet the freedom they need by installing a pet screen door. Call 718.984.1300 or 718.984.2100 for more information!